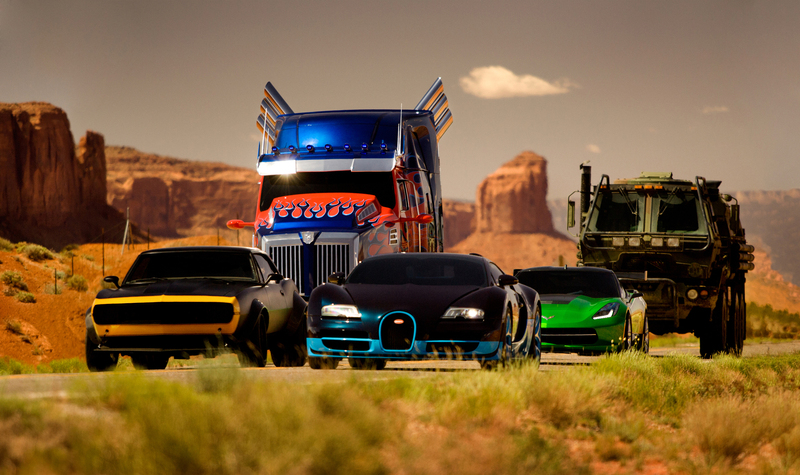 Five Years after the Battle of Chicago, The Autobots are known now as a Threat to Humanity. A CIA Black Ops Unit known as Cemetery Wind begins hunting down the Autobots and killing them. In Texas, Inventor Cade Yeager finds a broken down old truck and decides to sell it for an Auction. He then finds out that the Broke Down Truck is Optimus Prime. Cemetery Wind then finds out Where Optimus is and Invades Yeagers Home. Yeager, His Daughter, His Daughters Boyfriend, Optimus, Bumblebee, Crosshairs, Drift and Hound are now on the run and wanted by the US Government. And to make things worse, A Bounty Hunter coming from Cybertron known as Lockdown is after Optimus and is Allies with the Government. And now They are all on the run and It's up to them to stop Lockdown and Cemetery Wind. Five years after defeating Sentinel Prime and Megatron in Chicago, the Autobots have gone into hiding after the government deemed all Transformers as threats, and thus, began to hunt them all down. The government have thus replaced the Autobots with their own Transformers using technology from the fallen Transformers. For a reward, Texas mechanic Cade Yeager finds a truck that turns out to be the leader of the Autobots known as Optimus Prime. As the government hunts down all Transformers, Cade and his family are involved in the business between a bounty hunter and Optimus. "That's a bad idea but then again I'm all about bad ideas." – John Goodman's fat Transformerbot. That line sums up this mess and maybe a majority of Michael Bay's career. Frankly, this bad idea didn't work for me on any level at all. I really hated this effort start to finish. Everything is decisively stupid and every attempt to deliver anything resembling real dialogue or real emotion is an absolute insult to the viewer. The only aspect that falls more flat were the numerous attempts to inject humor. Nothing was remotely funny and every effort is injected at the weirdest time in the worst way possible. This has to be the absolute worst big budget blockbuster I've paid to see in years. The bloated running time only serves to insure that most viewers will leave with some level of a headache after sitting through this brain- damaged mess for three hours. The finale is cartoon crazy and visually interesting with Dinobots going nuts and ships and cars dropping from the sky. Also, they kill their "Jar Jar Binks" early on and that was a bonus. So, those two aspects save the film from being a complete 0/10 but just barely. I thought I knew what to expect after having seen the other Transformer movies but this time around I didn't feel entertained or in awe of anything. In fact, I actually groaned when they movie shifted to China because I knew that there was a lot of running time left to endure. BTW- anyone else irked by how the US government is so very evil here but Communist China will rise to protect it's people in danger? I know that's box office pandering more than any type of political commentary from a mindless movie but it still sits wrong. I can see reviews that are harshly saying that this movie is bad. I humbly would like to disagree with that. I'm not a comic fan though. I'd say only the last 20 minutes were messed up - badly. I have really enjoyed the rest of it. The characters had to built up, don't forget they're all new. The plot is all new too, after Chicago. These all needed time to escalate - somewhere. The view of CGI is beautiful, but that's just a trademark. This franchise was primarily made to entertain You, not for rising deep thoughts; think about that haters. The story, well, that could have been more deeply explained. The motivations of the humans are understandable, more or less. But this new foe. Why actually appears? Why now? For me: It was just dropped in with some made up cause, that's it. The last 20 minutes... come on, that made me a little disappointed. How can I say without spoiler... Recruiting for the last fight, cut, fight, done, cut, kiss, cut, Optimus does his thing, lets roll ending credits. All this happens in 20 mins, roughly. Bam! No cool down, no explanations, no conclusions! It's like: interpret as you wish, use your imagination... The warm-up was extremely long, and no cool down. That's messed up Mr. Bay, badly. Optimus Prime - Leader of the Autobots who has been upgraded and now transforms into a rusty Marmon cab-over truck and later a Western Star 4900 custom, blue with red flame decals. He now wields a sword and a shield. Bumblebee - An Autobot scout. He has been upgraded. His new alternate mode is a modified 1967 Camaro SS and later a 2014 Camaro concept. He can transform both arms into plasma cannons, which are also missile launchers. In the trailers, Bumblebee can also be seen using a cable gun. He speaks using radio recordings from his alt-mode (although it has been shown he can speak normally). Ratchet - An Autobot medical officer who transforms into a green-and-grey Search and Rescue Hummer H2. His weapons include a Cybertronian rotary saw that emerges from his left arm and can transform his right and left arm into a medigun. He is brutally killed by Lockdown and Cemetery Wind. Leadfoot - An Autobot who is also member of the Wreckers. Transforms into a red #42 Juan Pablo Montoya NASCAR Target Chevrolet Impala. He was killed by Cemetery Wind, as shown via recordings in the film. Brains - A former Decepticon brain unit who had escaped and joined the Autobots. He transforms into a Lenovo ThinkPad Edge laptop. His right leg is damaged and he relies on a make-shift cane to move around. He was captured by KSI and forced to analyze the brains of various deceased Transformers to help build the human-made prototypes. Hound - An Autobot commando who transforms into a Medium Tactical Vehicle from Oshkosh Defense. His robot mode has a beard, a "beer belly" similar to Leadfoot, and a bullet for a cigar, as well as numerous weapons, make him look like a stereotypical gung-ho soldier. He has a southern American accent. Drift - A former Decepticon tactician who has joined the Autobots. Transforms into both a helicopter resembling Mil Mi-24 and a Bugatti Grand Sport Vitesse. His robot mode is similar to a samurai, and his helicopter blades from his alt-mode serve as his swords. He has a Japanese accent. Crosshairs - An Autobot paratrooper who transforms into a C7 Corvette Stingray. His robot mode has a "trench coat" and goggles, making him look like a pilot from the 20th century. He also has a British accent. Grimlock - Leader of the Dinobots who transforms into a metallic horned Tyrannosaurus Rex. He lacks the ability to speak and acts like primitive beast. He attacks Optimus Prime when asked to join forces but is soon tamed and allows Optimus to ride him into battle. Strafe - A metallic twin-headed, twin-tailed Pteranodon. Slug - A metallic spiked, bestial Triceratops. Scorn - A metallic three-sailed Spinosaurus. Decepticons who appeared in the last three movies have all been killed and Michael Bay stated that it will remain that way. Though he said that before becoming the director of the fourth movie, and Bay has been known to change his mind. Megatron's remains, however, are seen in the film, and they have a significant role regarding the human-made Transformers. Some viewers claim that Starscream's head can be seen when Joyce is giving a tour of his facility, but others only notice Sentinel Prime's head beside Megatron's. Galvatron - A human-made Transformer who becomes possessed by Megatron's mind, thus making him the new leader of the Decepticons. Transforms into a 2014 Argosy Freightliner. Stinger - A human-made Transformer with a robot mode based on Bumblebee who becomes a Decepticon spy under Galvatron's control. Transforms into a 2013 Pagani Huayra. Junkheap - A human-made Transformer who becomes a Decepticon under Galvatron's control. Transforms into a Chinese garbage truck of Waste Management Inc., and his robot mode is capable of splitting into three components. Replaced Wreck-Gar, who was originally scripted to appear. Traxes - Numerous human-made Transformers who all become Decepticons under Galvatron's control. They transform into different colored (red, blue, black and silver) Chevrolet Trax cars. Unknown human-made Transformer - Transforms into an orange McLaren MP4-12C. Robot mode never shown in the film. Unknown human-made Transformer - Transforms into a white Aston Martin DBS. Robot mode never shown in the film. The Transformer Bounty Hunters are explicitly explained in Michael Bay interviews, in film dialog, and in recent cartoon shows to be neither Autobot nor Decepticon, but a neutral third party that works for the alien creators of the Transformers. None the less their methods are clearly malevolent. Lockdown - An intergalactic bounty hunter and the main antagonist. Transforms into a Lamborghini Aventador LP 700-4 Coupe. He is killed by Optimus Prime. Steeljaws - Numerous techno-organic wolves working for Lockdown. There are numerous unknown humanoid robots without alternate modes working for Lockdown. There are also various aliens that are found within Lockdown's ship, though they are captured and locked up in cages. Seemingly by only minor but noticeable cosmetic changes. A picture of extinction Optimus is here. A picture of initial trilogy Optimus is here. It is possible that the Autobots were hunted down and most likely killed, since the government ordered the Transformers' termination. This is shown in the film to have happened for Ratchet and Leadfoot. But it is unknown Sideswipe, Roadbuster, Topspin, and Dino would have suffered the same fate. Given that Brains is shown and looks pretty messed up, it can be assumed it's from the crash he and Wheelie were in in the third film and that Wheelie did not survive. 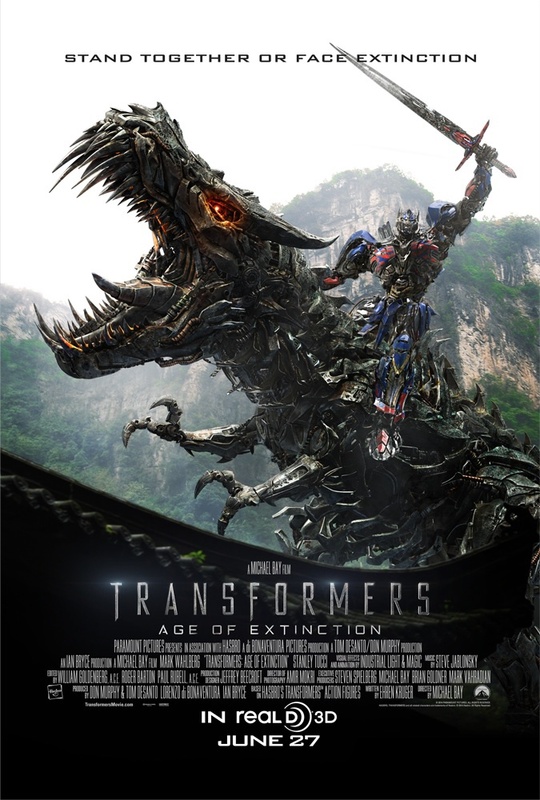 The beginning of the movie reveals a thin alien hand creating the Dinobots on a prehistoric Earth. Later in the present day, Lockdown tells Optimus that he works for these aliens, that they once traveled the universe creating new Transformers on each planet they found, and that Lockdown's job is now to hunt down all Transformers and return them to these alien creators. The movie ends with Optimus leaving to search for them before they can hunt him down again. Who these aliens are in the movie continuity won't be completely certain until the next film, but \in the original cartoon series they are the Quintessons, half robotic squid-like creatures with five faces. In the cartoon the Quintessons first created Cybertron and then they created the Transformers there. They created two classes: servants (Autobots) and soldiers (Decepticons) but the Quintessons cruel nature lead to a rebellion which in-turn lead to the Transformers civil war. What little is shown and discussed of the Transformers' creators in this movie is slightly different from their original TV counterpart, so what exactly they are won't be known until the next sequel. In this movie the organic-like metal substance that makes up a Transformers body is properly cloned by the company KSI and is trademarked as "Transformium". Deep fans of the franchise may not like that this is a new word created specifically for this aspect of the movie. In the original series Energon and Cybertonium were the matter that made up Transformers, but there were a number of potential reasons for creating the new word instead. First of all, Energon had already been used in the first two movies as the power source behind the All-Spark, even on the original television show Energon was simply their power source and not their very matter. On the show, Cybertonium was the closest thing to their matter, but it was never explicitly described as the metal that made their bodies, but a vague science-fiction element that gave their bodies stability. The show never described their bodies as made of anything but normal metal. So in an attempt to make the science of Transformers slightly more grounded, the writer of this movie explains that it is a form of matter separate from any other found on Earth. This gives a Transformer its ability to heal from horrible damage and to be fueled indefinitely some validity. As for naming it Transformium, the human scientists were far more familiar with the word Transformer than the name of their home planet Cybertron. No, Cade Yeager and his daughter Tessa Yeager are original creations for this film. Unlike the Witwickys who are an entire family of characters who appear across various separate Transformers franchises, all the human characters in this film are completely new. Cade is, however, loosely based on a comic character called simply "the mechanic".